Looking for the Best Cabin Tent? Our top pick as the best cabin tent is the Kodiak Canvas Deluxe Tent. It's an 4 season cabin tent designed to handle various weather conditions. The mesh that covers the windows is small enough so that even tiny bugs can't get in to ruin your camping. What truly improves your group camping experience is the size of the tent. It can fit eight people, and the ceiling clears at 6'6". All of it is held together by durable steel rods so you can ensure that you'll have the ultimate group camping fun in a tent that will last for several seasons. Camping with a large group of family or friends can be an incredible experience, one made better by having the appropriate tent. To make sure you have the most fun possible, consider large cabin tents that are spacious while having a good amount of air circulation so that it doesn't grow uncomfortable with that many people inside. Good durability is also an essential factor to look for as you want your tent to hold up to more than just one camping trip. To help you find the right tent to have the ultimate group camping experience, we have examined products from the best tent brands and reviewed five top-selling products. Before we get into the reviews, however, we created an extensive buying guide so that you understand more about cabin tents to know which one to buy. Finding the right cabin tent for your group camping trip may not be a decision that you want to make quickly. A proper tent can make sure that your experience is remembered for all the right reasons. So, we've broken down some key aspects that you may want to consider before you go out and buy a cabin tent. When you're buying a family camping tent, size is an apparent vital feature. The more people you camp with, it's evident that space becomes a factor. Though they're large, cabin tents still come in a variety of sizes that can fit different people from 6-person to even 10-person. If you're bringing six people, you may want to go for an 8-person tent as that will allow you more room to breathe. Regardless of how many people come along on your trip, it's a safe bet to find a tent that fits a few more than who you have, so you have room for gear as well. Lastly, look at the height of the tent. Even though some tents appear to be roughly the same size concerning width, not all of them have the same center height. If you want the most room, taller may seem better. It can also help out if you're camping with taller individuals. Some center heights are around 5'6" and others that exceed 6'. Besides the size, think about the overall layout of your tent of choice. Many tents have vestibules by the door separate from the sleeping areas. This is where you can store bags, shoes muddied from being outside, and anything else that can get in the way. In addition to that, you can separate rooms for privacy purposes. If your tent lacks one of those vestibule areas, you can always use a room divider, if it's included, to stash your gear. Even though you have more people camping, you may not want to lug around stuff that's too heavy. If so, consider finding tents that are designed with a lightweight frame. This way, you won't have to worry much about carrying it around. Just something to keep in mind, however, is that the more lightweight a tent feels, the more chances it has of being less stable to hold up in harsh weather conditions. If you know you're camping in heavy winds and the likes, then you may want to go for a tent that holds some more weight. They may not always be the easiest to carry for extended periods of time, but they will more than likely withstand rough conditions well. Having your tent last season after season will make sure that you'll enjoy these fantastic group camping trips for years to come. So, it can be useful to check out the materials such as the fabric and the poles. Steel poles are among the most durable, which is especially useful for cabin tents considering their size needs some extra support. Other material can work as well such as aluminum as long as they're reinforced. As for the other sections of the tent, it benefits if the floor is as waterproof and secure as the rest of the fabric. This will help to keep you and your things dry all the way around. 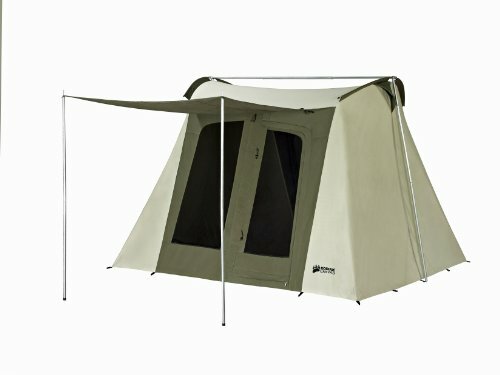 Looking For A Specific Size of Tent? Cabin-sized tents can commonly take time to set up and break down, so you probably expect a quick setup with all of these tents. Most of the tents can take up to 20 minutes to assemble, but once you make a habit of it, you should be able to construct it faster. There are instant tents as well that can be pitched in a far shorter time. Kodiak Canvas Deluxe has an almost primitive-like design compared to other cabin tents that allow it to stand out. It's made with two large doors on the front, and the back for multiple entrances and the mesh screen on the windows is fine enough to ward off small insects. For durability, the tent's fabric is 100% cotton duck canvas that holds still in harsh winds, a factor that may benefit those who want to sleep soundly without hearing the fabric billow about. It's also watertight so not a drop can get inside. This can be effective if you find yourself and your loved ones caught up in an unexpected downpour. To speak of additional accessories, this features a gear loft organizer that you can customize. It also has a large awning to offer shaded coverage when you enter and exit. Overall, it's seen as an all-season tent as it can work in various weather conditions. The Kodiak Canvas Deluxe is the best all-season product that has remarkable standing room, enough space for your gear, and the durability to withstand even the toughest of storms. Coleman Evanston may be an ideal tent for car camping during extended road trips. It offers a good amount of space for a small group of people to comfortably enjoy. With its hinged door, it's easy for anyone, even small children, to get in and out with no problems. For the campers who still need their tech gear, there's a simple electrical outlet that can fulfill your needs. It can even be protected as not to be disturbed by weather or unruly young campers. Concerning the weather, it's designed to keep you dry while you're inside. However, the porch area is prone to getting wet easily. This product does an adequate job at ventilating itself. It's especially useful on warmer days and nights. Consider this more of a summer or spring shelter rather than a winter or fall tent. The Coleman Evanston is a simple tent for the average car camping experience that's easy to set up and features a porch area to lounge in when the weather is nice. Wenzel Klondike can be a tremendous 8-person tent if you want an area to stargaze at night. It is one one of many cabin tents with screened porch that is broad and covered well with the awning and rainfly to help prevent rain from leaking in. So, not only can you enjoy the sun or the stars while staying dry, you can keep shoes and other gear on the porch without worrying they'll be destroyed. For more protection against water, the tent's polyester fabric is coated with polyurethane water-resistance all around. Along with the seams being double-stitched, it's rare for water ever to enter the tent so that you can sleep soundly in a gentle rain. 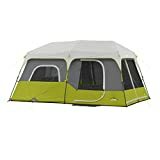 This tent does have a full mesh roof and windows that provide sunlight and a breeze while making sure those bugs stay out. If you need even more of a breeze, there's rear mesh vent that offers ground circulation. The Wenzel Klondike is a tent that may best serve those who want to relax in the sun or stargaze in the comfort of their camping porch without worrying about getting wet thanks to the weather protection. Core 9-Person Instant Cabin features a quick setup design so that you can get to camping and enjoying the outdoors faster. This features a room divider to offer privacy to anyone that may want it at the end of the day, an ideal feature that can make group camping more comfortable and enjoyable for everyone. Looking for extra space to store some smaller items? This tent offers storage pockets against the walls that not only get the little things out of the way but also keeps them from hitting the floor. If you need to use some electricity, there's a port that fully closes up when it's not in use to prevent it from being damaged. 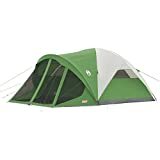 This has advanced venting features, something that can be useful if there are several people in the tent at once to prevent it from becoming muggy. It further helps keep things dry in the event of rain. To go further into the weather protection, the removable rainfly excels at preventing water from entering as well as holding up against the wind. The Core 9-Person Instant Cabin is the go-to tent for those who seek something fast to put together and take down while still having a spacious interior that you can easily stand up in. 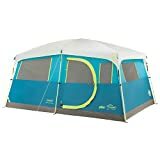 Coleman Tenaya Lake Fast Pitch can take away any stress of camping with the family or friends as it has numerous accessories to make everything even more enjoyable. For one, it features a closet where you can store other things out of the way. There's also a hanger bar and shelves you can install to organize things better. Entering the tent at night is made more comfortable with this tent. Not only is the door hinged, but it features reflective guy lines, so you always see what you are doing. Assembling this tent takes little time, and the same goes for taking it down. Once you're all finished, it packs away neatly in the wheeled carrying bag. The Coleman Tenaya Lake Fast Pitch Tent is one of the best cabin tents for beginning group campers as it's easy to pitch, comes with great accessories for extra storage, and offers a decent amount of weather protection.